Oriented strand board -- OSB -- derives its name from the strands of wood chips used in its production. Applied during construction, OSB is not considered insulated material; rather it replaces plywood during construction, being much stronger and made from sustainable woods. OSB installs externally while interally offering superior support. Contractors use OSB for external sheathing, internal subfloors and when adding structural strength to interior walls. OSB is not insulation, but is used in combination with insulation to form the exterior envelope for the structure. 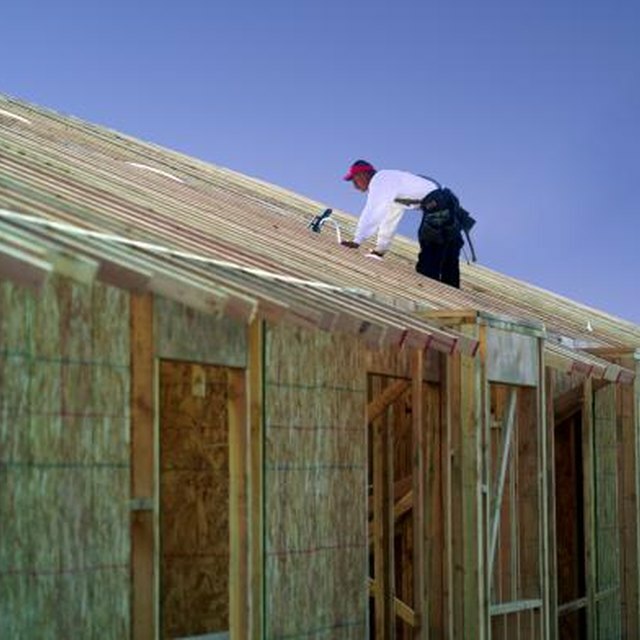 After installing OSB externally, a water or vapor barrier made from a fibrous woven paper sheaths the exterior of the OSB on the outside of a home. This barrier sits underneath the exterior siding -- placed over the barrier and the OSB -- to provide moisture protection for the home. On the inside of the framing, depending on the energy calculations for the home, install fiberglass insulation R-13 or R-19 batts against the interior of the OSB, between the studs. Other options include acoustic blanket material or rigid foam insulation. Like plywood, OSB has little to no insulating properties and requires installation with other materials for full insulation value. OSB comes in a variety of thicknesses depending on the construction application. Made in 4-by-8-feet panels, like plywood, thicknesses range in size from 1/4 inch to 3/4 inch, with other thicknesses available on order. At the time of publication, a 1/4-inch 4-by-8 sheet cost roughly $12. What Is the Width of an Average Wall?